Sometimes it’s not so much about going to a restaurant or specific place but about wandering round an area. 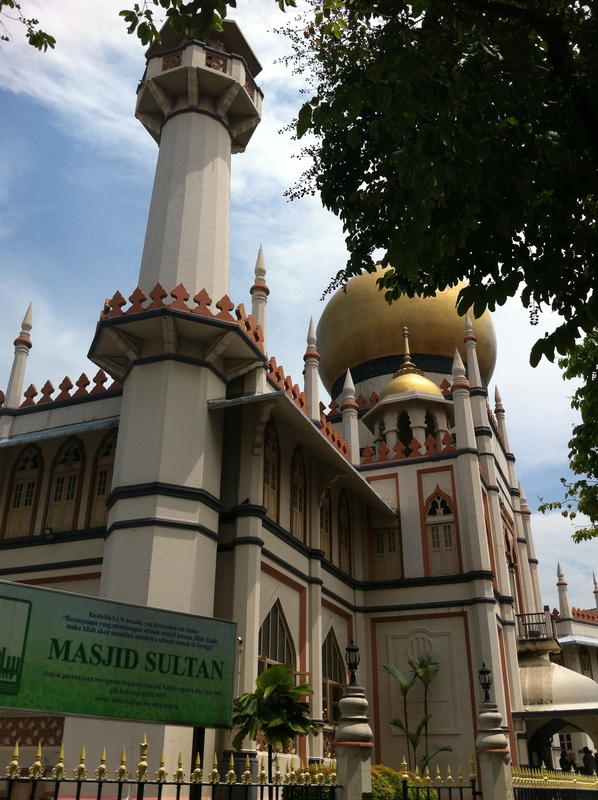 The other weekend we found ourselves in the Arab street area on the way to Play Eat Love and the kids were enjoying the sights. First up, yes this is just scratching the surface so please add into the comments your favourite bits of the area, be it architecture or shops or restaurants. 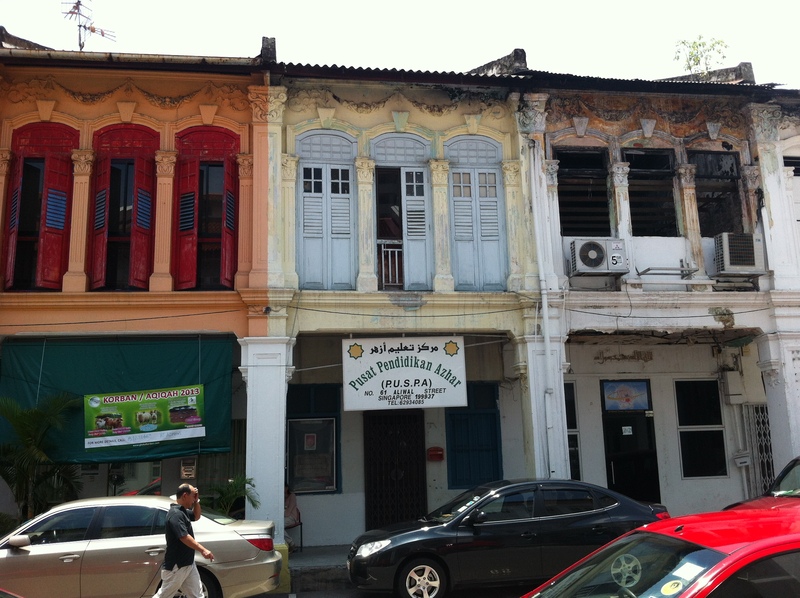 One of the first things that you will notice of the area is that it has managed to preserve most of its shophouses. I personally love how they are all painted different colours with their old fashioned shutters done to match. It’s also an area that feels like it’s grown organically rather than recently designed. You can see dilapidated buildings waiting for the next owner to come in and reinvent it. 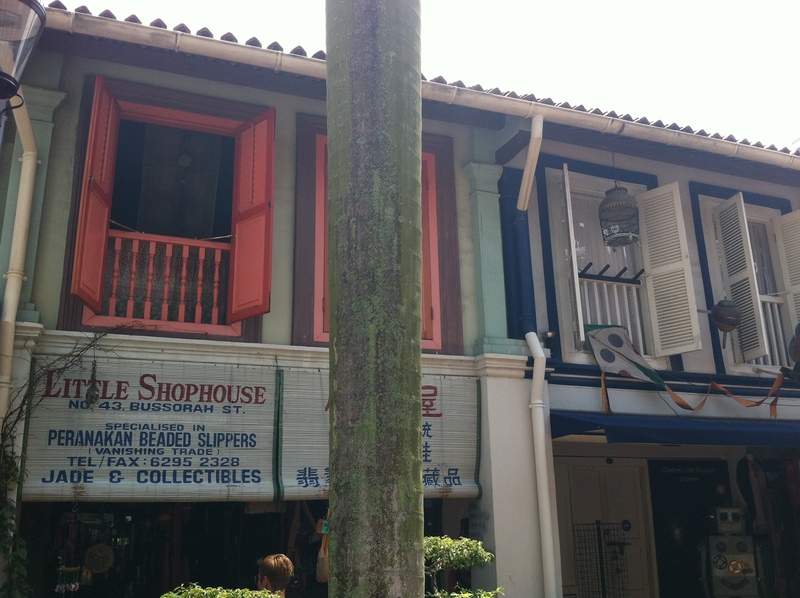 Not only are the shophouses great to look at but the shade provided makes walking around so much cooler. As each bit has been updated or added on they are not all at the same height and it does mean that there are plenty of steps, so pushchairs can be a real hassle. 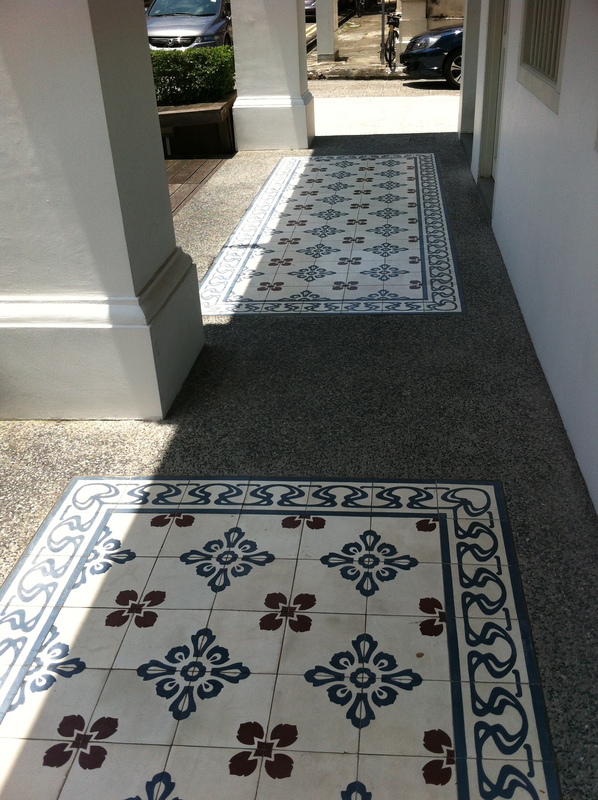 Being older though does have it’s benefits and there are some lovely touches such as the tile footpaths. You’re probably going to tell me that if they are that fresh looking they are new but they still look good. 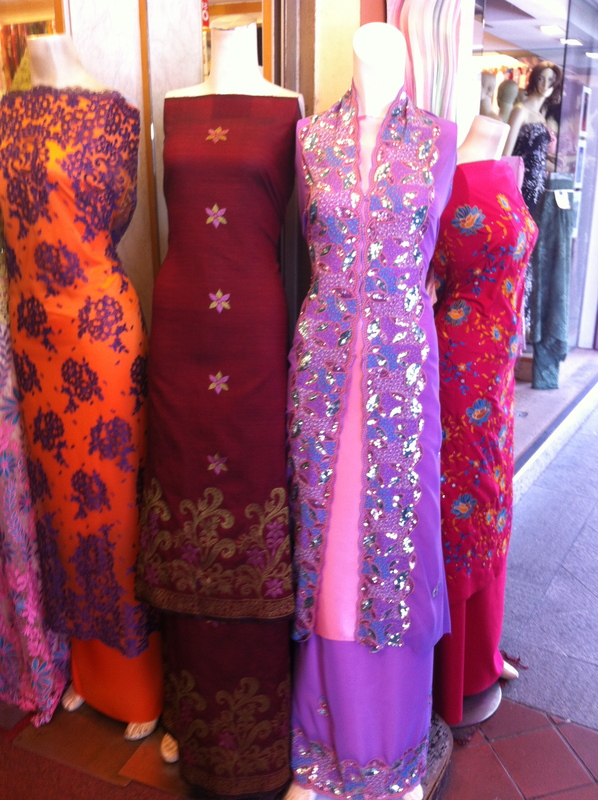 Arab street is famous for its cloth/tailor shops and carpet shops. The kids loved marvelling at the different cloths available and saying how pretty the dresses were. Just a little scared of the princess dresses that are going to be requested for birthdays now though. 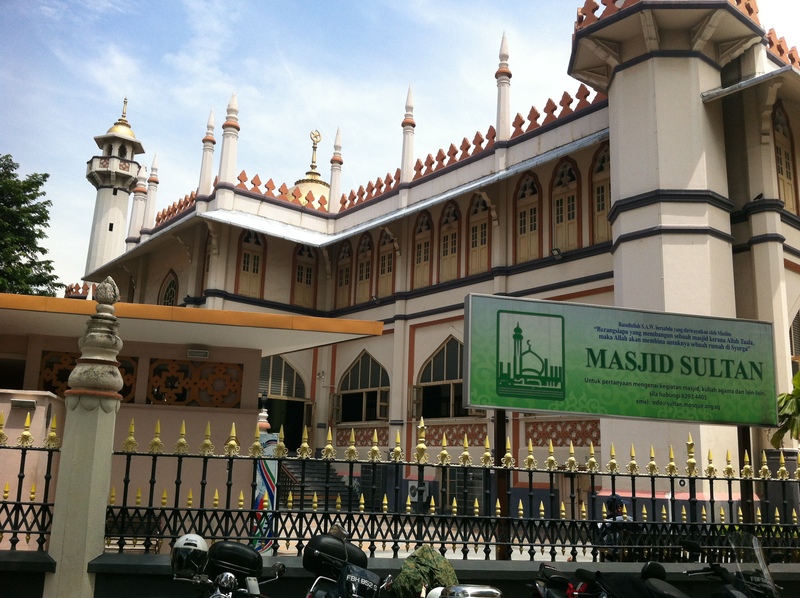 From an architectural point of view alone, the Masjid Sultan mosque makes a real statement and is worth the trip on its own. The pedestrian area around can be a little touristy but the tree lined street is worth a stroll down and the back packer hostel bar means you can get a reasonably priced drink. 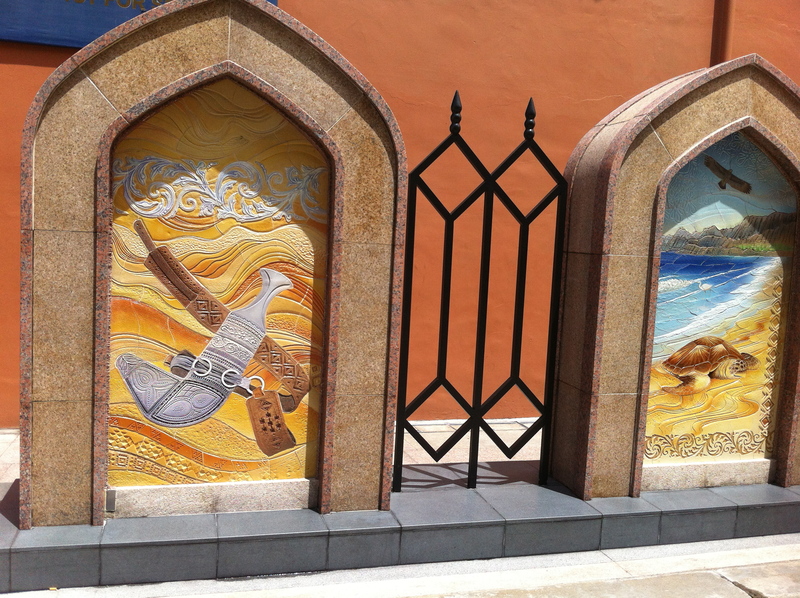 Our kids liked the mosaic murals that are also around here and I’m a great fan of street art in general. 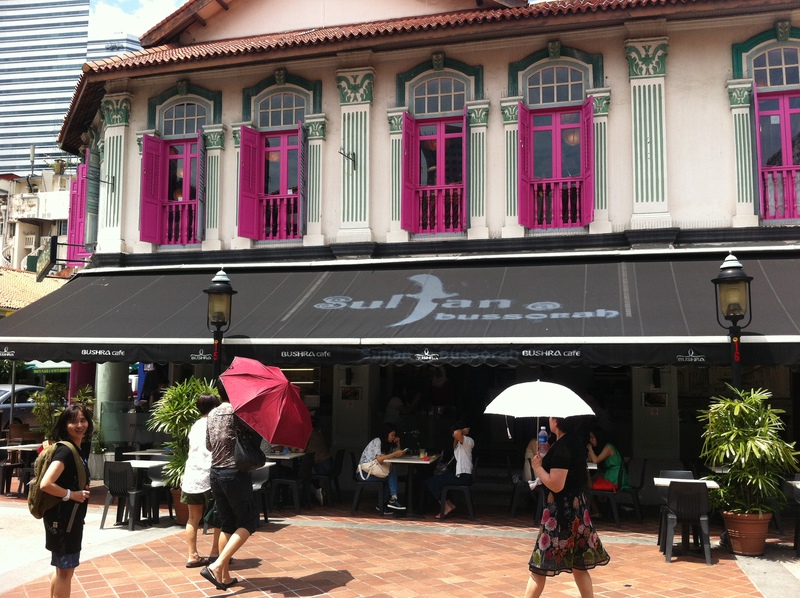 Arab street also has a thriving bar and restaurant scene. Obviously with many restaurants being Middle Eastern themed/origin, quite a few do not serve alcohol. We have not been to any recently but as we do I’ll write them up and I do remember sitting on carpets and daybeds for eating which the kids will love. For me the best thing about Arab street is that it at least feels like all the shops, bars, restaurants, etc… are independent and not chains. 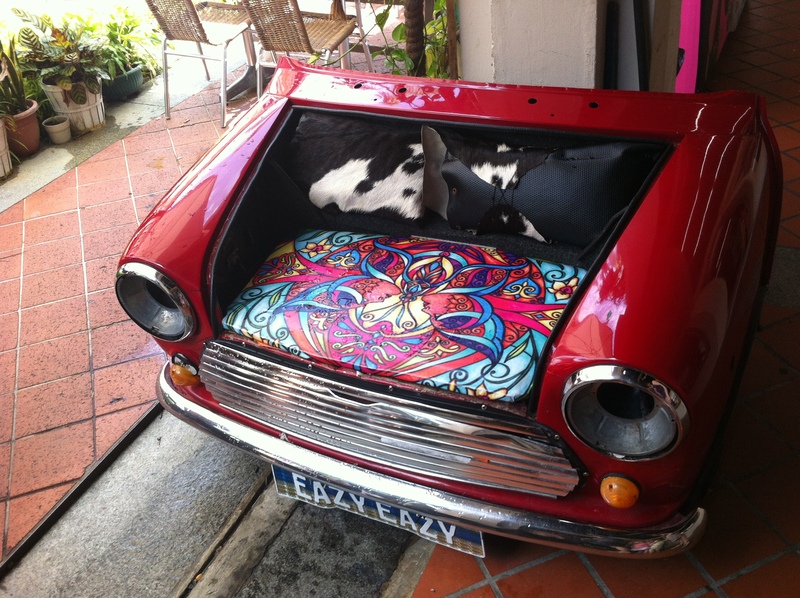 Also they are alternative/different/bohemian which makes the kids think and see things in a different light, such as the car seat below. As I said at the top this is just scratching the surface so please comment below to let me know about your favourite things about Arab street or things to avoid. 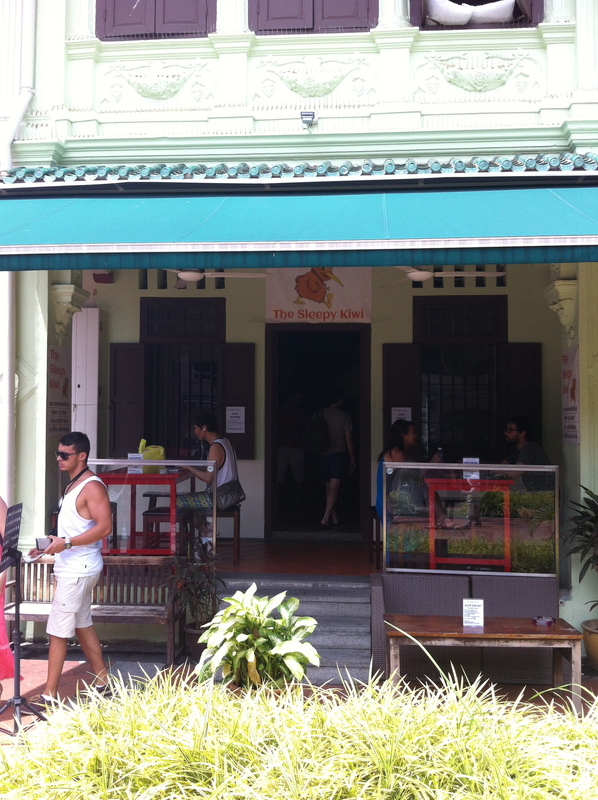 Spice Rovers post with a bunch of photos from Arab Street. I am looking forward to reading more about Arab street. Last trip was rushed. Next trip I’d like to fit places like Arab street in. 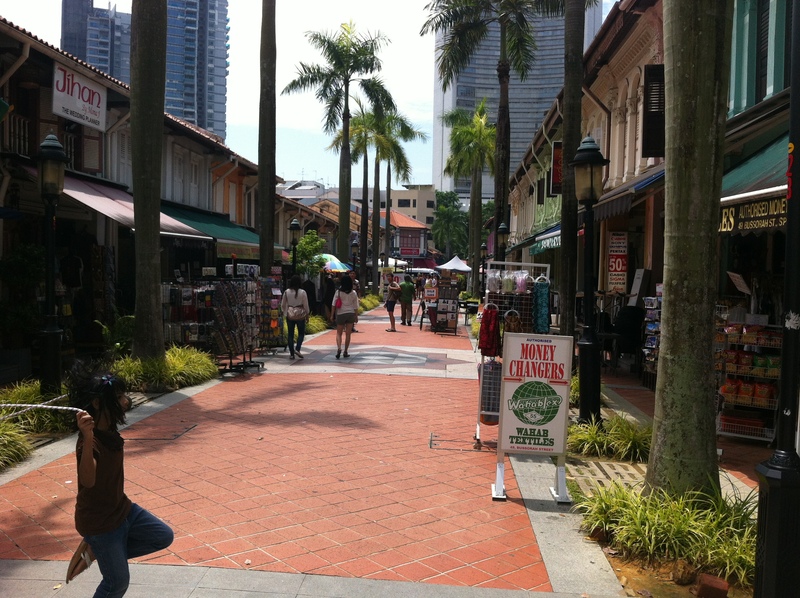 Arab street, little India, China town and Geylang are all worth a walk around to see the different cultures. I like just walking around in new places, and kids are a great help when it comes to paying attention to the often so fantastic details! You are so going to be in trouble with the dresses though! Ours are still quite young so it’s more pointing things out to them but you do look for details more to show them than when you’re on your own. We are probably due a trip to that side of town. Haven’t been there in… forever. I think with the kids being young we didn’t know how much they’d appreciate it (plus the prams) but seems like we are getting to the stage where it’s worth a go again. Yup we haven’t taken the kids round China Town either which I think they would like or get scared by the crowds…. I like Hajah Maimunah restaurant on Jalan Pisang, just off Arab Street. The best traditional Malay food in town, in my opinion. Their kuehs are very yummy too…. I have to warn you, though… the food is mostly spicy, and you might have to be quite adventurous to try dishes like “siput sedut” or “cumi hitam”….. Sounds like a date night rather than family resturant for us, as the kids wouldn’t cope with the spice. You really have an eye for details. Maybe I am used to such streets in Singapore hence not as observant as you are. Your photos made me rethink how I should appreciate vintage and designs on the walls and floors the next time I go there.